Light up the space you walk into wearing this net lehenga. This drape in Pink and Green is enhanced with zari work in Abstract motifs along the border. 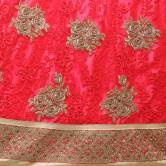 A broad panel along the lahenga flare border, featuring fine zari, cording and Sequins work in motifs adds to its sheen. A contrasting Lace Patch Border adds to its grace. 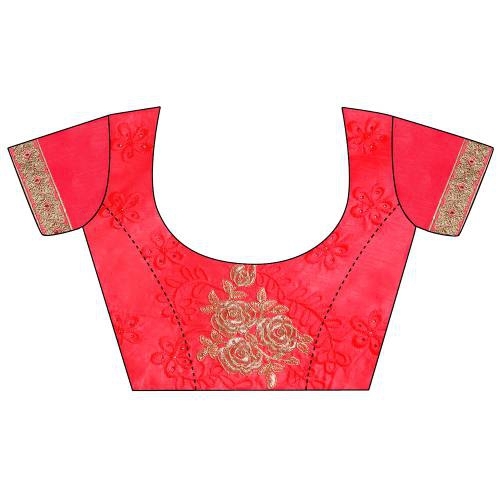 As shown, a Red raw silk embroideRed Blouse in Unstitched form accompanies it.